Shipping Rules is a feature which allows you to create sets of conditions which control the way your orders are shipped to customers. It includes rules about weight, value, destination-based, SKU based, box and so on. 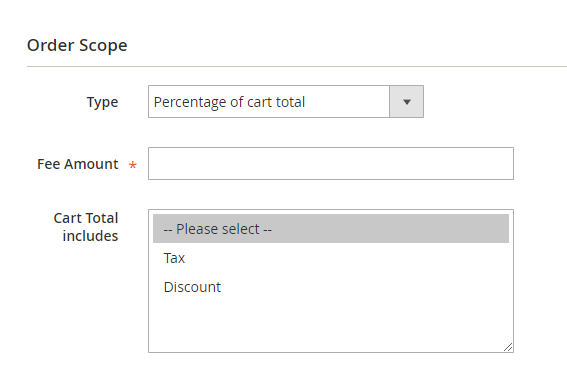 With Shipping Rules for Magento 2 by Mageplaza, you will be able to create unlimited shipping rates which followed several specific rules. Thank for this extension, shop owners can now adjust the shopping costs in order to make it suitable in different situations. This is one of the most noticeable features of Magento 2 Shipping Rules. It allows you to create as many rules as you want. Then from DHL, Federal Express, Best Way, Flat Rate, Free Shipping, United Parcel Service, United States Postal Service, you can apply them to some specific shipping methods. 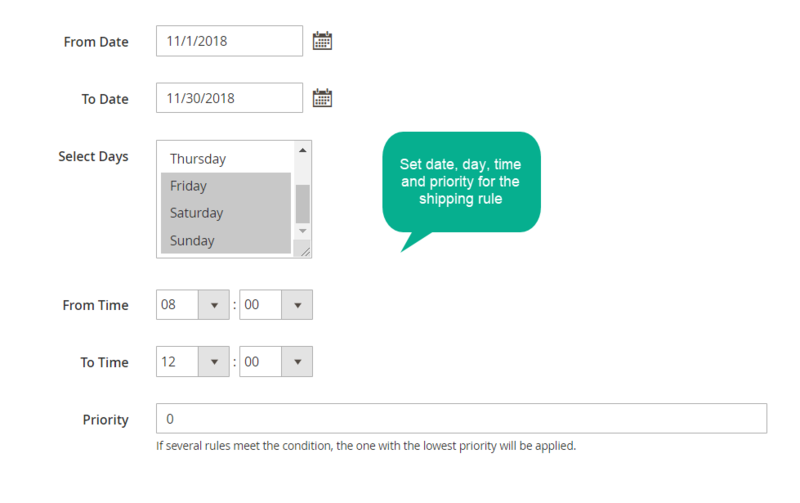 When you set a new shipping rule, you have to based on the new conditions and the selected cart price rules which have already been configured. 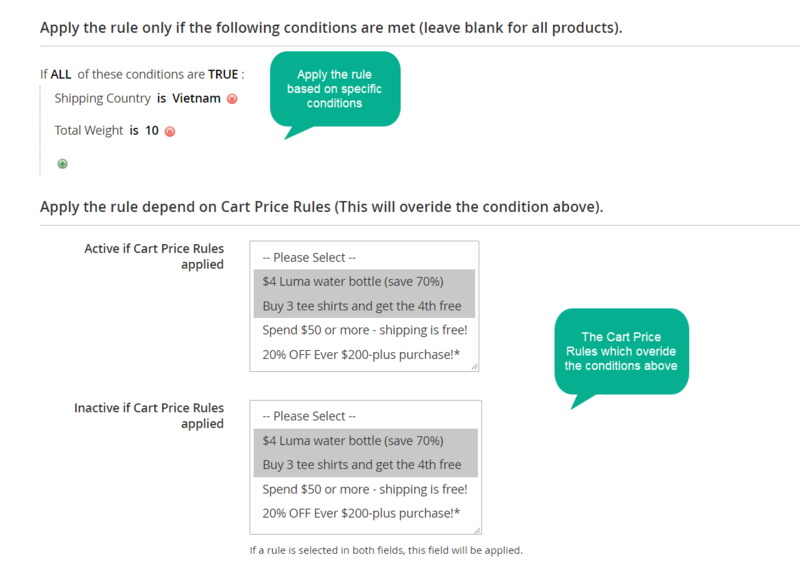 Also, the new conditions for the shipping rule will be activated, or not depending on the application of cart price rules to the purchasing of customers. Moreover, you can set the product attributes combination, products subselection or condition combination as your conditions. 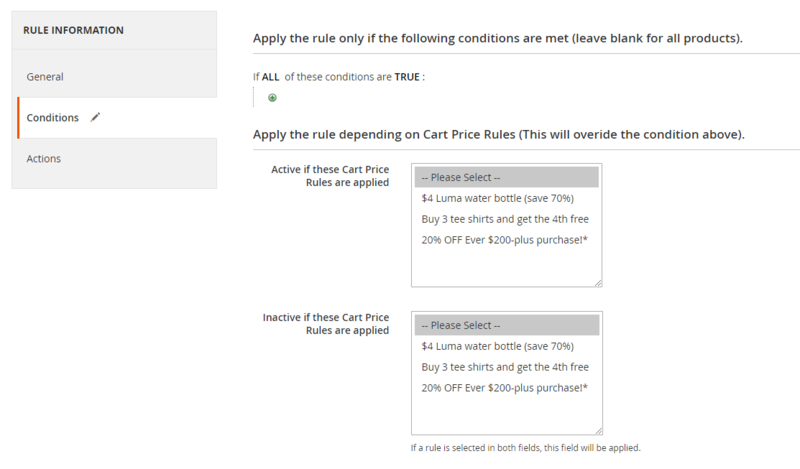 For instance, you can set the total weight is 30 kgs as a shipping rule for the carts which are shipped from Vietnam. 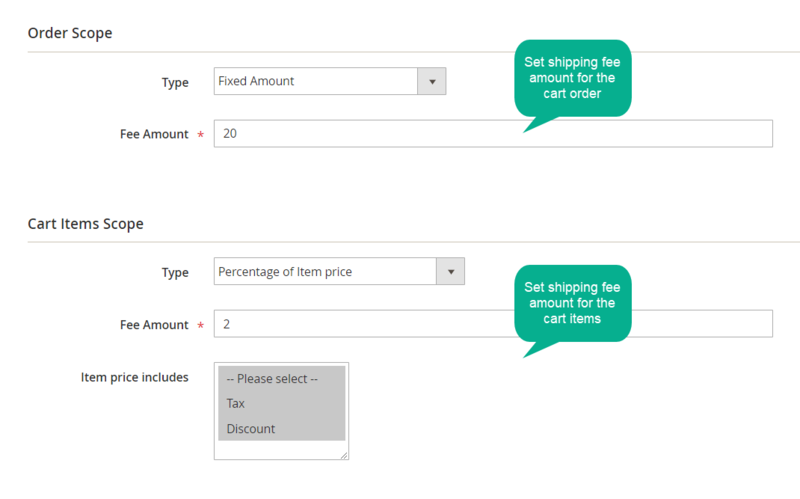 Once the purchasing of customers meet the activated conditions, they would have to select how to apply new shipping fee, set shipping fee amount for cart and set shipping fee amount for the selected product. These actions will determine the rates of shipping which are counted for the order of customers. For each order of a customer, a specific valid time can be set for its shipping rate. 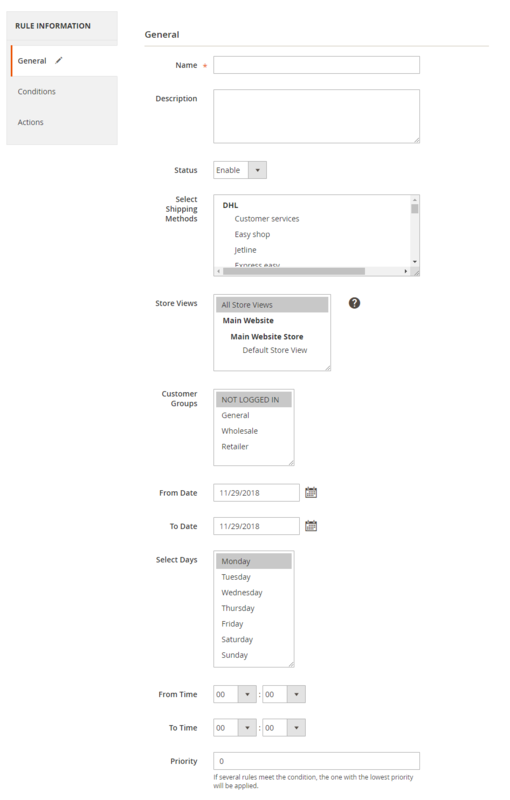 The admin can define the date, days, and time for each rule from the admin backend. After that, the rule will be activated during the valid period automatically. When your stores are running a promotional campaign, or in a peak shopping season, this feature would become helpful. For example, during Black Friday season, you can set the shipping fee is 5$ for orders. 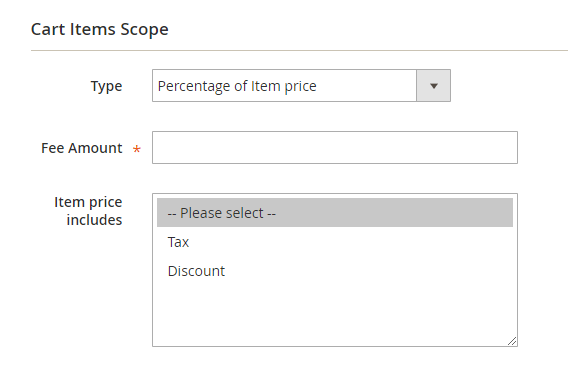 You can set the visibility of shipping rates based on store views and customer groups. If the store owners want to employ a specific shipping fees strategy to a particular group which is targeted, using this features can make them more flexible. With countries in different time zones, applying the time which is configured with those countries. For example, Vietnam is in the GMT + 7 time zone, US is in the GMT - 5 time zone, if you choose 8:00 AM as the Time From, then when customers make purchases the rule will be applied at exactly 8:00 AM in both Vietnam and US. For example, admin configuration Minimal fee change is $5. After calculating the shipping fee will be $20. The original shipping fee is $10. So the actual shipping charge that customer will have to pay is $10 + $5 (if How to apply fee = Add extra fee) or $10 - $5 (if How to apply fee = Subtract extra fee). The Maximal fee change will be similar. For instance, admin configuration Minimal of Total Shipping Fee is $15. After calculating the shipping fee will be $12. So the actual shipping charge that customer will have to pay is $15. Same with the Maximal of Total Shipping Fee, the Maximal of Total Shipping Fee is $25. After calculating the shipping charge will be $30. So the actual fee for shipping that customer will have to pay is $25. Shipping rules for Magento 2 is a must-have tool for online stores which employ many different shipping methods and want to apply other shipping rates to various product types. This extension does not limit the number of rules you can create for delivery which helps a lot in delivery management.